In the context of the restoration study a thorough and detailed engineering geological design study has been compiled. Works included surface mapping in scale 1:500, underground mapping along the tunnel in scale 1:50, lab testing and reporting. Extracts of the findings of this study is given in the paragraphs that follow. 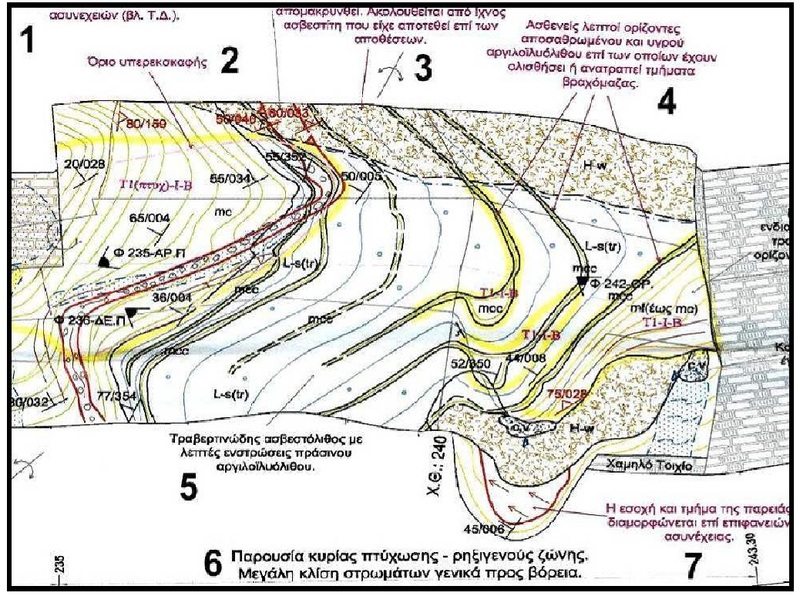 The geological sequence in the area of Eupalinos aqueduct includes the upper Quaternary formations that cover discordantly the Miocene molassic formations of Kastro hill that contain the sequence of Hora and the lower one of Pythagoreion. The first part of the aqueduct from the Agiades spring up to the north portal of the main bored tunnel has a length of ~890m. It is in the mid-upper Miocene formations of the thinly bedded (3-20cm) marly limestone for almost half of its length. The other half, towards the north portal of the main tunnel is in alternations of fissile marl, green clay shale and thinly bedded limestone. Scree, mixed with the ancient tunnel excavation products form a quaternary deposit on the top of the later formation. The main tunnel was excavated in massive to medium bedded limestone, travertine marly limestone (RQD% 70-100, UCS 40-150MPa), thinly to medium bedded marly limestone with marl intercalations (RQD% 10-50, UCS 20-50MPa), thinly bedded to shaly marly limestone, marl and clay shale (RQD% 0-20, UCS 5-20MPa), breccia (at the south portal) and mylonite zones in faults. The north section of the tunnel has a length ~610m. Out of these 610m the ~210m are lined. Practically the tunnel lining has been constructed in the north tunnel bore excluding the 18m of lining at the south portal. The presence of the lining is a sign of both the adverse geological conditions and the subsequent need to support the excavation. Almost all of this tunnel section has been excavated in the folded thinly bedded shaly marly limestone, marl and clay shale. These formations are water bearing almost all along this part of the tunnel; water is present as drops and occasional inflows. The south section of the tunnel has been excavated mainly in the massive to medium bedded limestone. Thin-bedded marly limestone appears as intercalations at the end of this tunnel section under the apex of the mount Kastro. Except one location, where a water flow has been observed, the rest of the tunnel is wet to damp and in portions dry. In order to quantify the hazards along the tunnel, a hazard ranking assessment along the tunnel was created. The tunnel divided in hazard zones according to criteria such as: a) mode of the potential failure (e.g. detachment of rock along the bedding plane, minor rock slides in loose mylonite etc), b) visually estimated probability of failure and c) potential volume of failure. The Figure below shows a typical section of the unfolded tunnel projection with the engineering geological mapping and the respective hazard ranking. This figure shows an ancient (?) cave-in in ch 661-552. 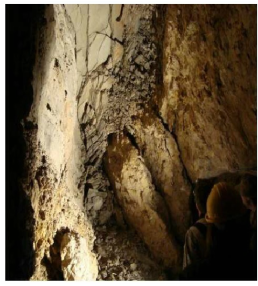 The hazard at this location for example is further development of the cave-in by falling of rock pieces along the bedding plane from the sidewalls and the roof. Translation of annotations: 1: Over-excavation at the roof along the axis of an anticline and fault. Falls along bedding plane and discontinuities. 2: Limit of overexcavation 3: Trace of man-made ground that has been removed. Follows a trace of calcite deposited on the deposits. 4: Thin horizons of weathered and damp clayey siltstone that caused slippage of the rock plates. 5: Travertine with horizons of green clayey siltstone. 6: Main fold associated with fault zone. 7: Portion of the sidewall is formed along joint planes. T1-I-B is a hazard class. Another ancient (?) cave-in has happened in ch 537-528. 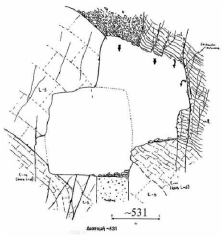 The Figure on the right is a cross section in ch 531 showing the trace of the original excavation geometry. The rock fall has happened along a system of subparallel faults that brecciated the rock at the tunnel roof and sidewall (see photo below). The hazard at this location is also the gradual further development of the cave-in. Minor rock pieces have fallen from the tunnel wall damaging the girders that cover the aqueduct canal. The rest of the aqueduct (~500m) from the south portal to the city has been excavated from vertical shafts that are interconnected by underground excavation (18 shafts). Only the top of the shafts are easily accessible. It is in clay sandy scree that includes limestone fragments and boulders.